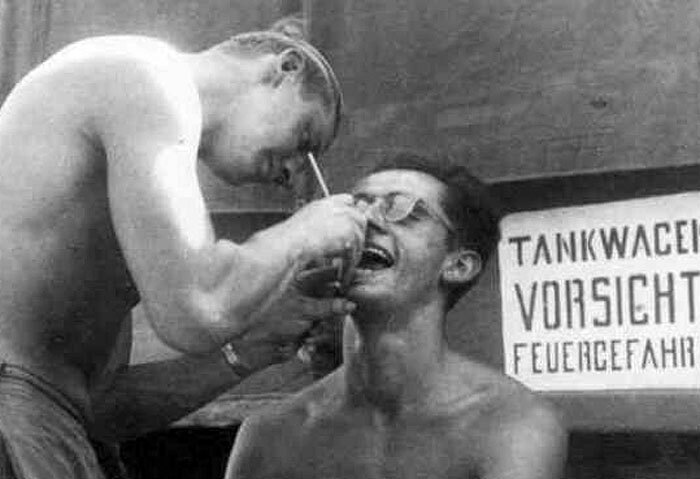 Home >Think Tank > German WWII> Feuergefährlich - Rauchen verboten! I became curious. Was it a standard sign? Which vehicles used this sign? I started looking for other photos and I found more than I expected. 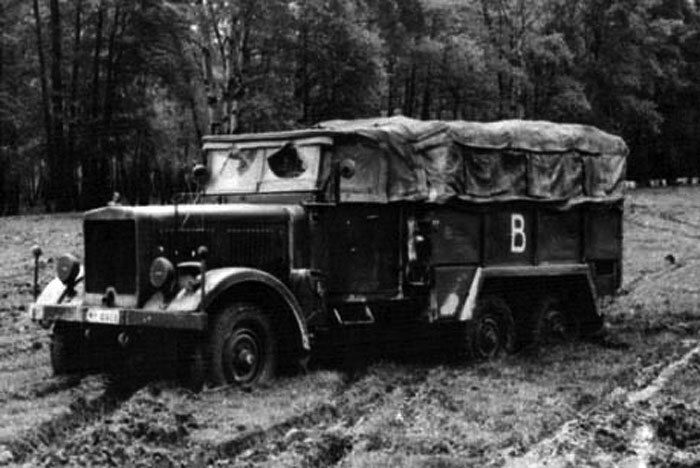 The Lorries belonged to the supply services (Nachschubdienste) which support units within larger units. 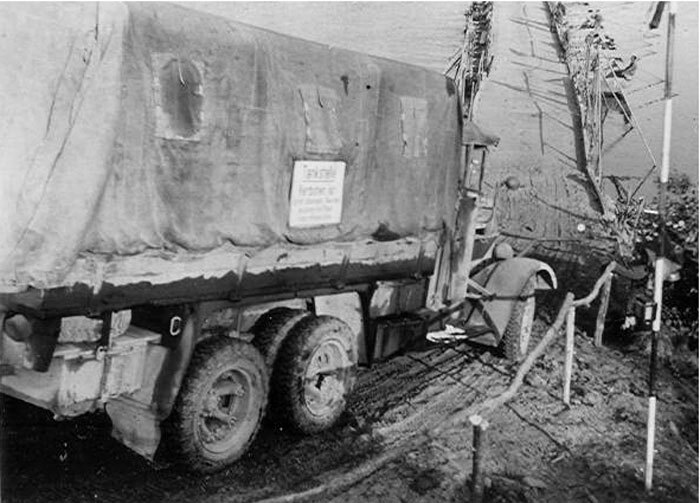 These were Lorries tasked with transporting liquid fuel. 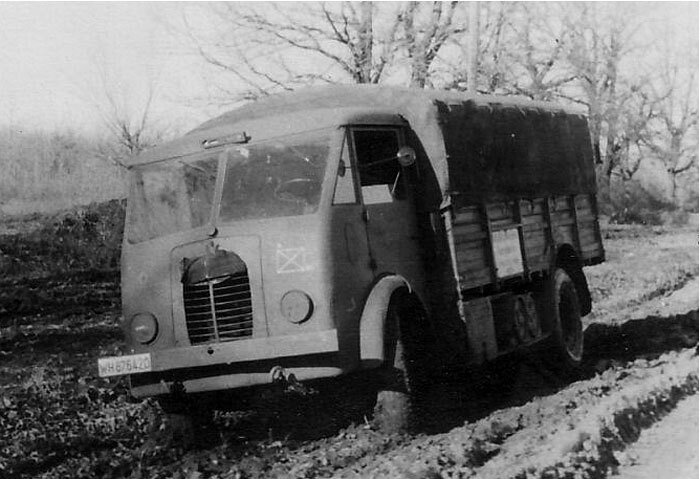 Unlike the Luftwaffe, the German army rarely used tanker Lorries. 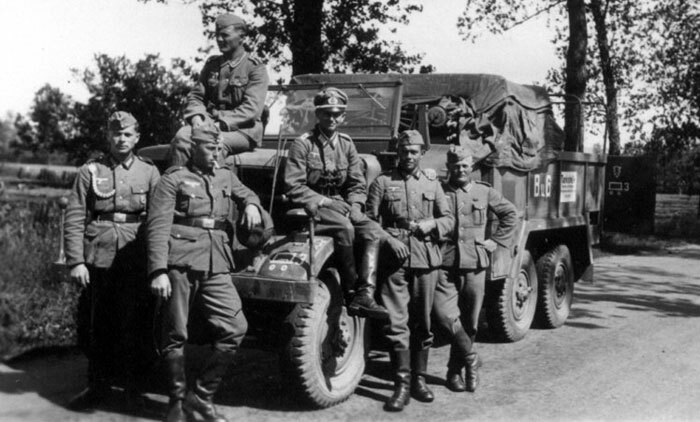 Occasionally, they used confiscated vehicles from the occupied countries. 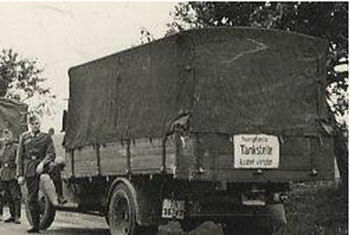 Instead they used typical Lorries to haul 200 L. drums or 20 L ”Wehrmachtskanistern”. 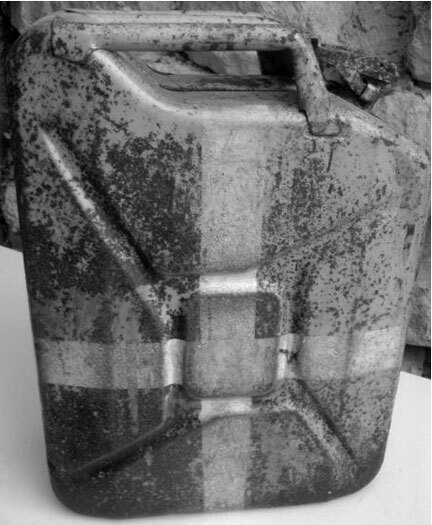 Today better known as ”Jerry Cans”. 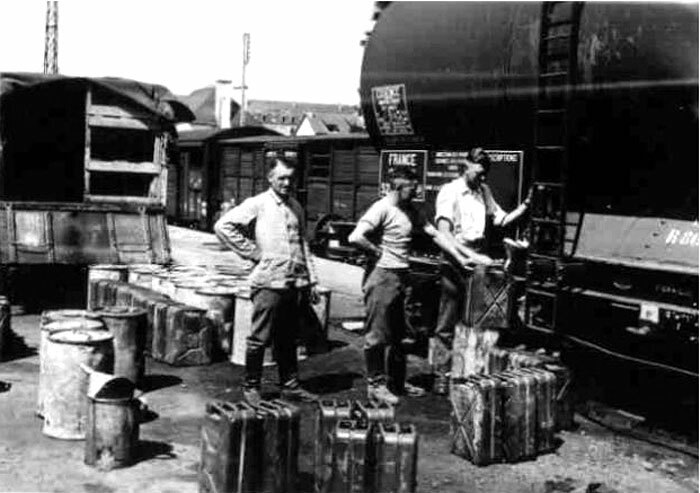 Fuel was picked up at the closest useable railway station were it was delivered by either tank wagons or already filled 200 L. drums. 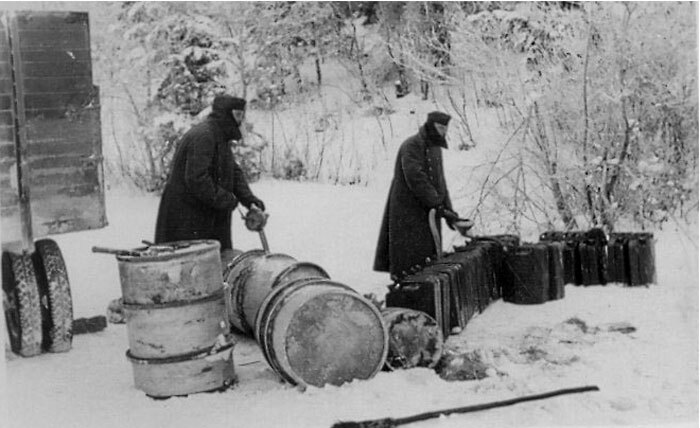 The drums on this photo are 50 L. drums for ”Glysantin Frostschutzmittel” (Glysantin antifreeze solution) maybe here reused as fuel drums? 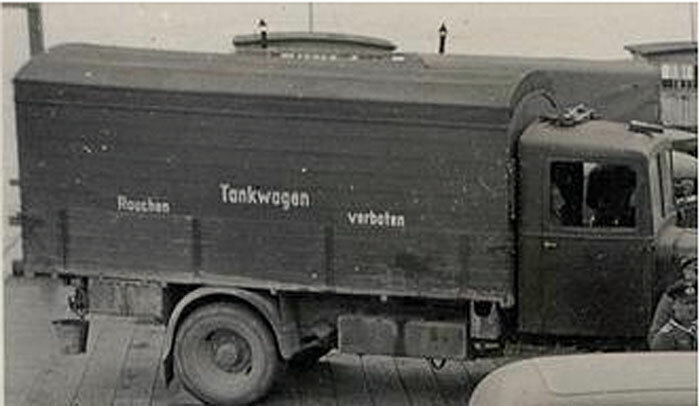 The 200 L. drums could be used directly or the fuel could be poured into the more manageable 20 L ”Wehrmachtskanistern”. 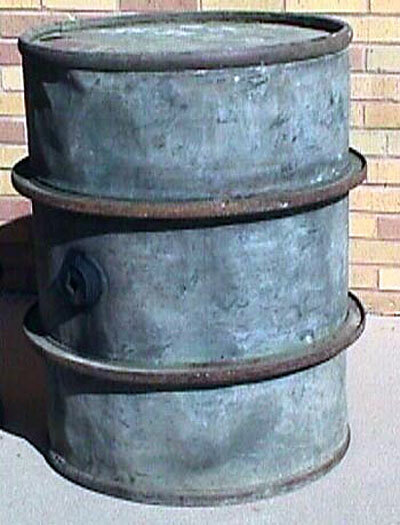 The 200 L drums were zinc coloured and, depending on who used them, had Wehrmacht, Heer, Kriegsmarine, or Luftwaffe embossed into the lids and bottoms. 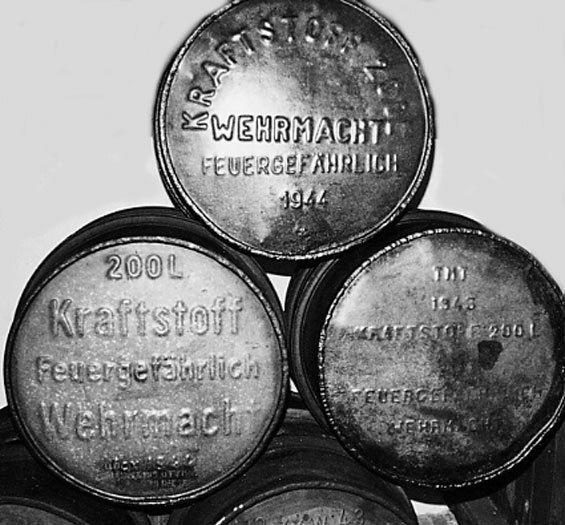 The photo shows drums marked with ”Wehrmacht”. The text was similar but could be seen with different style and size. 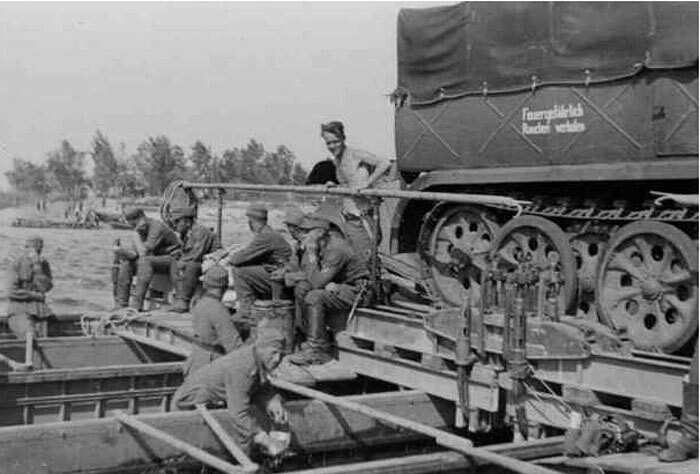 The German ”Wehrmachtskanister“ exists in at least 5 different versions. Above is type 1, to below is type 3. Type 1. The first type with the straight X was in production from 1936 to 1940. 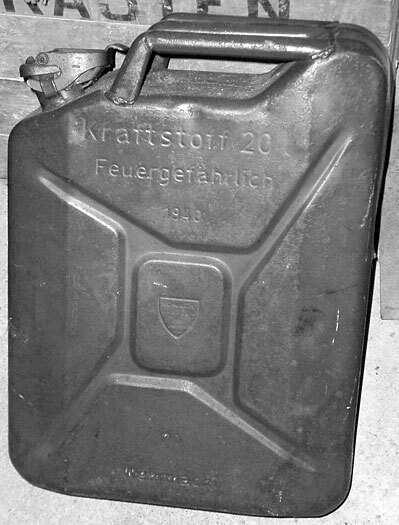 The markings on the side are: “Kraftstoff 20 L”, “Feuergefährlich“, year of manufacture, the maker’s logo and/or the factory code. This type was used until the end of the war. Type 2. 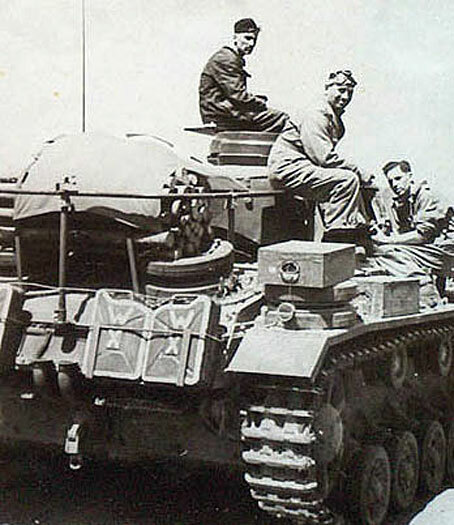 Is the very rare 10 L Wehrmachtskanister which is made from one side of the normal 2 sided (Type 1) 20 L. can. 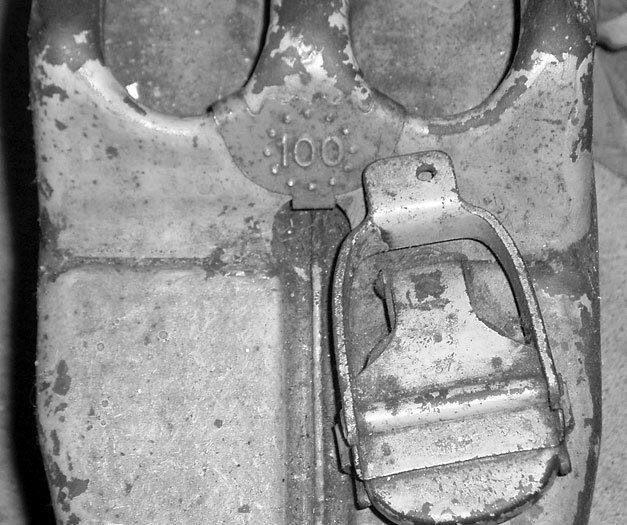 The text on this type is: “Kraftstoff 10 L”, “Feuergefährlich“, year of manufacture, the maker’s logo and/or the factory code and production number. This can have the same outside height and width as the 20 L. but is only half as thick! Type 3. Third type is the one with the square in the middle of the cross. It was in production from 1937 to 1945. 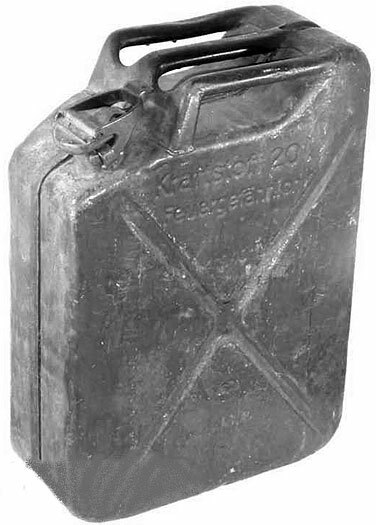 The text on this type is “Kraftstoff 20 L”, “Feuergefährlich“, year of manufacture, the maker’s logo and/or the factory code, production number and “Wehrmacht“. 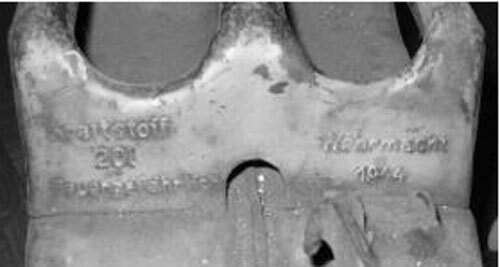 The text “Kraftstoff 20 L”, “Feuergefährlich“, “Wehrmacht“ and year is also embossed into the front of the handles just behind the spout. 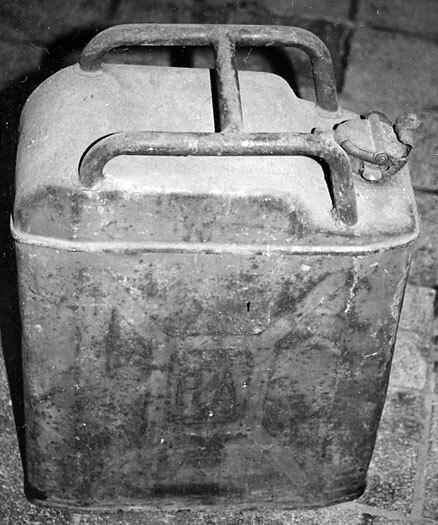 Type 4 has no text on the side of the can but is embossed with the text: “Kraftstoff 20 L”, “Feuergefährlich“, “Wehrmacht“ and year on the front of the handles like type 3. Type 5 is the civilian version. 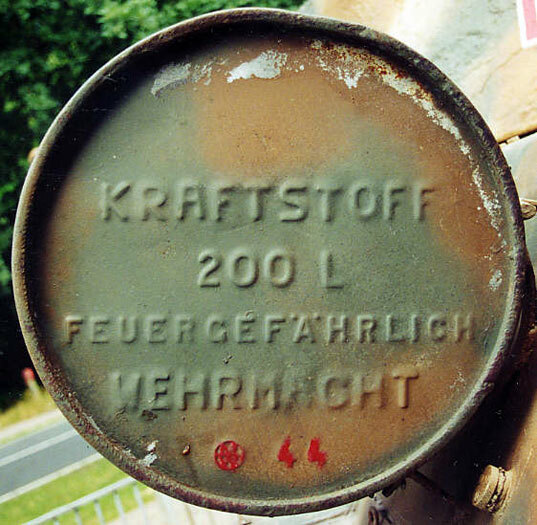 Text: “Kraftstoff 20 L”, “Feuergefährlich“, year of manufacture, the maker’s logo and/or the factory code and production number. These cans were all produced for civilian use. 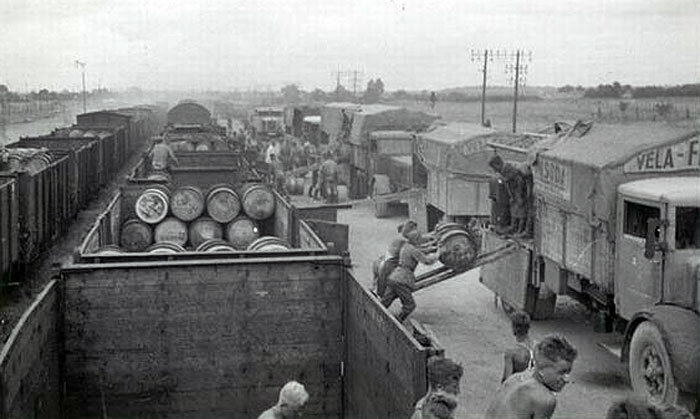 Production continued after the wars’ end. 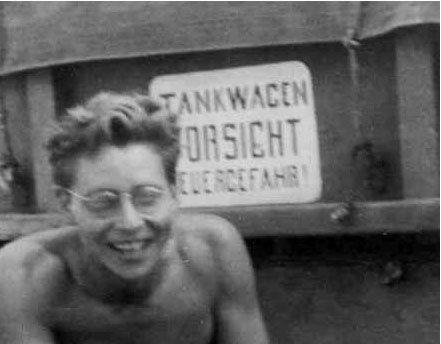 Maybe not even a German produced ”Ersatz” can, but anyhow painted with the faint letters: “Kraftstoff 20 L”, “Feuergefährlich“, “RA” (inside the square ), year and “Wehrmacht“ at the bottom. 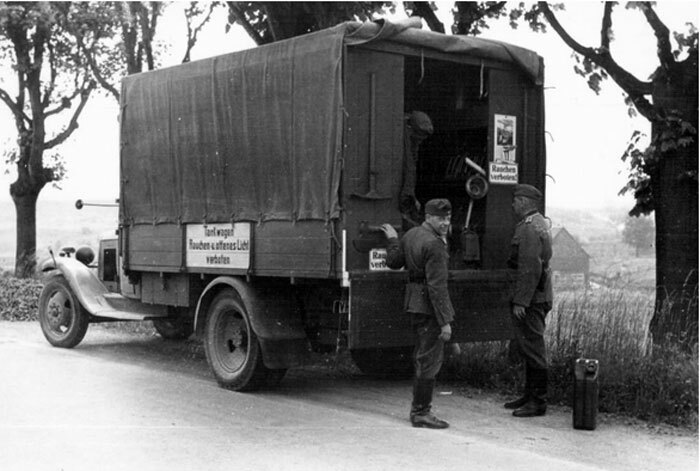 The 20 L Wehrmachtskanister were also used for water but was then marked with the embossed text ”Wasser 20 L”, year of manufacture, the maker’s logo and/or the factory code, production number and “Wehrmacht“. In addition, it was always marked with a large painted white cross on both sides of the can. 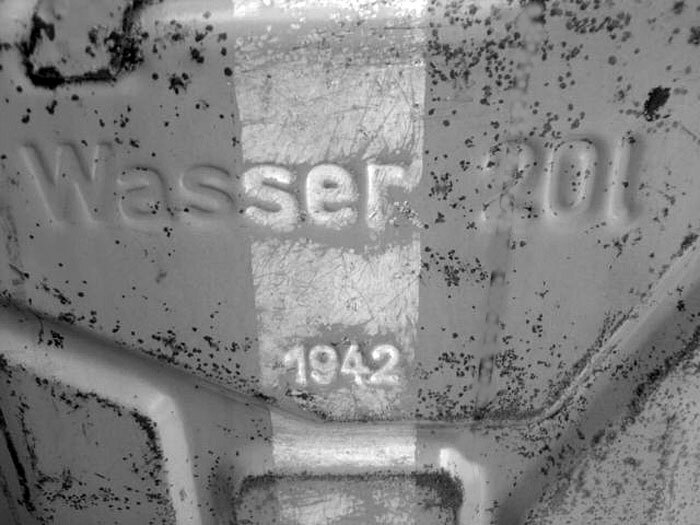 The 20 L Wehrmachtskanister could also be marked with a single “W” painted on the upper part of the side of the can. This was not for ”Wasser”, but "Winterkraftstoff" – a special diesel mix that could withstand down to -200. 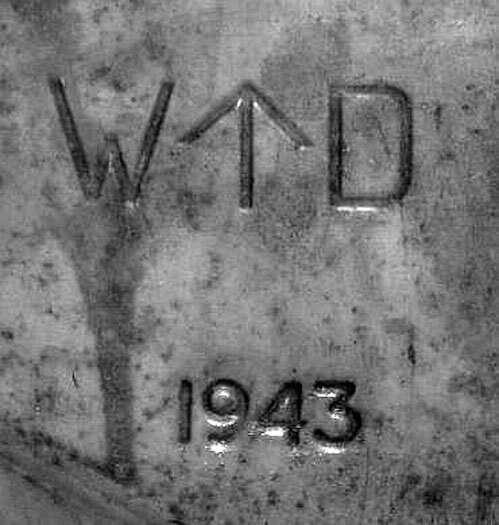 All cans containing this mixture were marked with a white painted ”W”. Some crews added further markings to prevent mistakes as seen in the second photo. 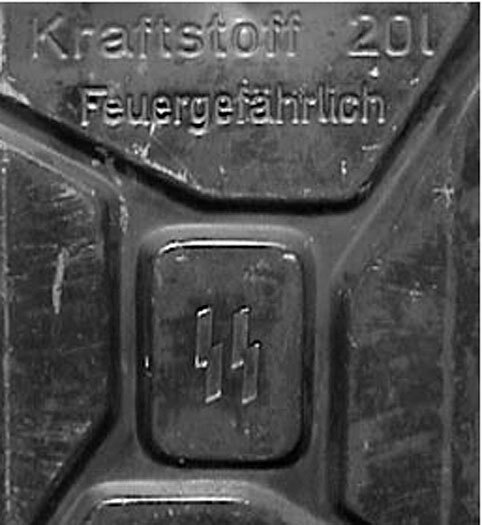 Cans belonging to SS have embossed SS runes in the square field on the side of the can. 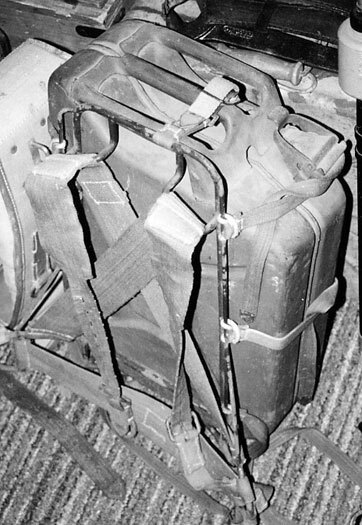 Pack frame M43 (Tragestell M43) which was able to (among other things) transport fuel cans on the back. It is important to note that while painted markings appeared on both sides of the can, on all the different cans, the embossed texts were only on one side! 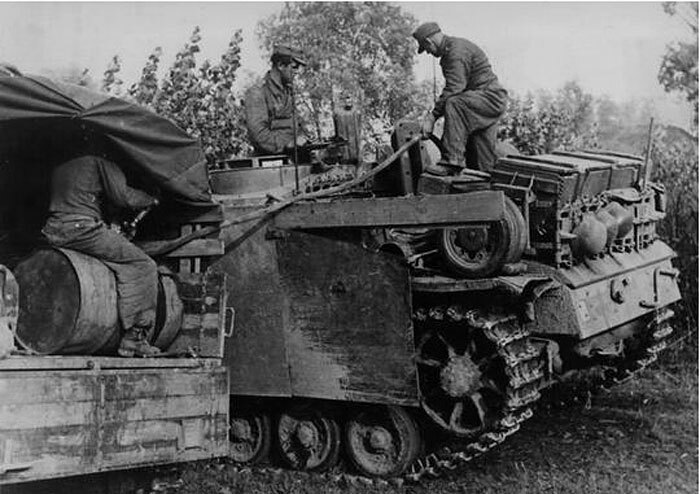 The British quickly discovered the benefits of the German 20 L Wehrmachtskanister and copied them. 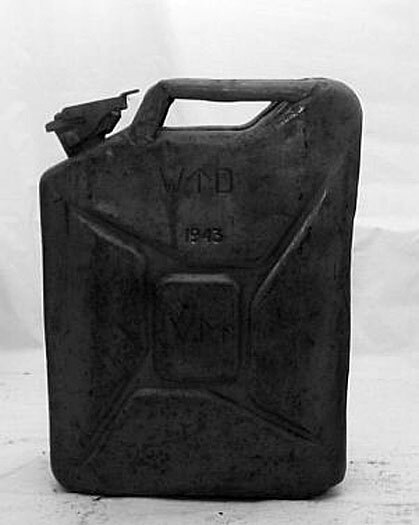 The British nickname for Germans was "Gerries" - hence "Gerry cans" or as better known Jerry cans. The British cans can be identified on the markings on the side of each can. 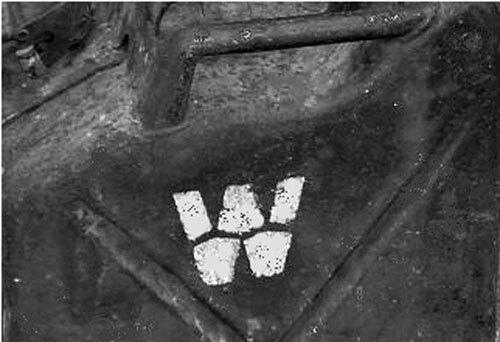 The text was: "W (upward pointing arrow) D”, year of manufacture and the maker’s logo/letter code inside the square in the cross. W (arrow) D means ”War Department”. The use of the cans quickly spread among the allied countries. 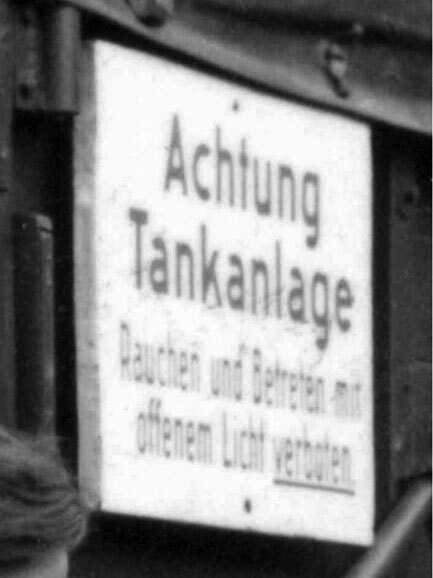 The Germans needed a quick way of identifying the content of the drums and cans. An obvious method would be to paint them in different colours but this was impractical if you were in the dark of the night. The solution was simple. Drums and cans were marked with a small sheet metal sign mounted on the front of the handles, just behind the sprout. 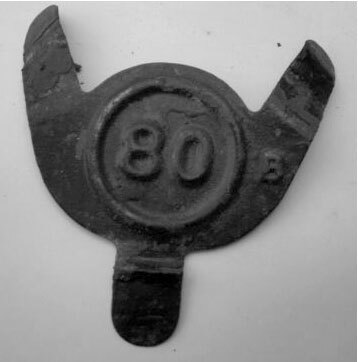 The sign for Benzin were an embossed unbroken circle or if it was Diesel a dotted circle. Octane or Cetaine numbers were inside the circle. A small “B” or “D” told if it was Benzin or Diesel (if you had forgot the meaning of the circle). This sign was easy to find even in darkness and with your fingers you could also easily feel if it was an embossed Diesel or a full Benzin circle. 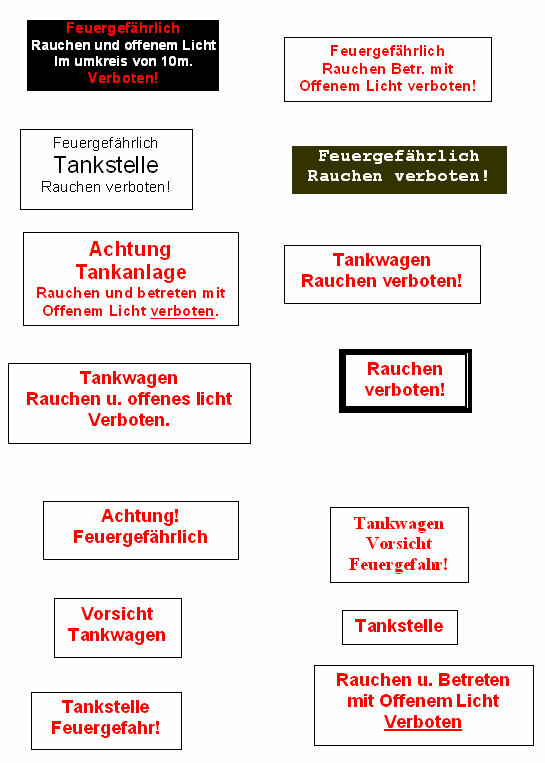 Diesel signs were black (FS 17038), Benzin were red (FS 11302) or green (FS 14066) depending on the octane number. If there were no sign it was the water can you got your hands on. Red German 80 B, 80 octane Benzin sheet metal sign. 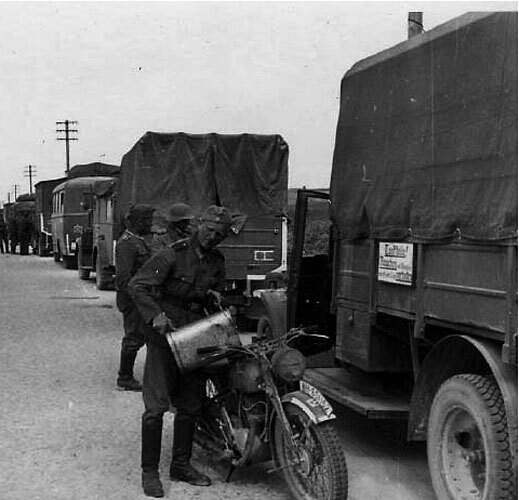 The signs were also copied by the Brits as can be seen on the British Jerry can on the right. 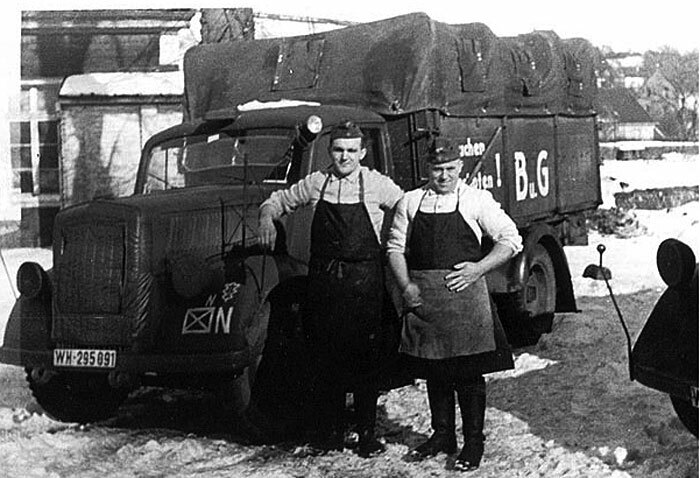 Before the outbreak of the Second World War most of the German fuel transport vehicles were marked either with a large painted “B” or a “B u. G” (Betriebstoff und Gerät for Fuel and equipment). The letters could be either on the doors, side of the cargo bed or on the back of the vehicle. 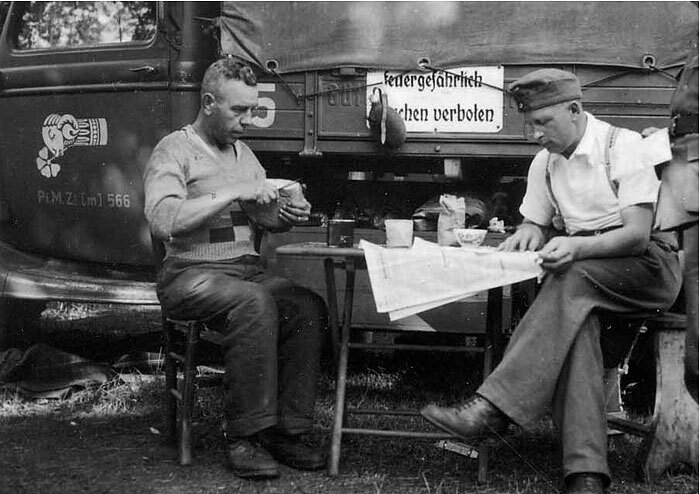 After the outbreak of the war most letters were made considerably smaller or completely removed. Instead signs with flammable content warnings were put up. Rauchen verboten! 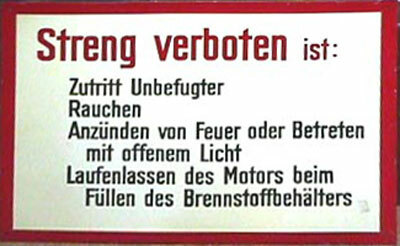 B u. G. “No smoking, Fuel and equipment“. B „Fuel”. I have identified the following text on the flammable content warning signs. 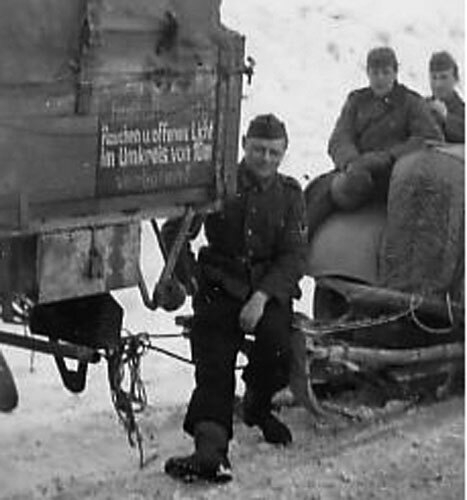 This seems to confirm that there was no standardised sign in the German army. On most of the signs it looks like some of the letters were written in red paint like on the signs below.